That’s right, the weather has gotten the best of us today, so our launch with Linda Wiken will now be taking place on Sunday, April 22 from 3:00-5:00pm instead of today. We hope to see you all then! 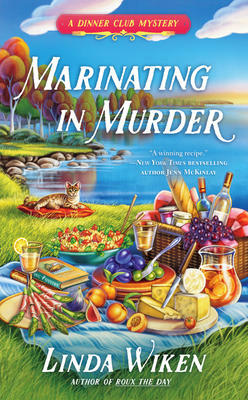 Local mystery author Linda Wiken will be here on Sunday, April 22 to launch Marinating in Murder, the third book in her Dinner Club Mystery Series. The launch will take place 3:00-5:00pm, complete with snacks, refreshments, and a reading! Linda is also the author of The Ashton Corners Book Club Series, penned under her pseudonym, Erika Chase. Next Next post: Tips for a bookish March Break: Hilary was on CBC!